July is the best time of year to find juicy, fresh cucumbers, so we had ways for you to use them in healthy cucumber recipes each day this week. 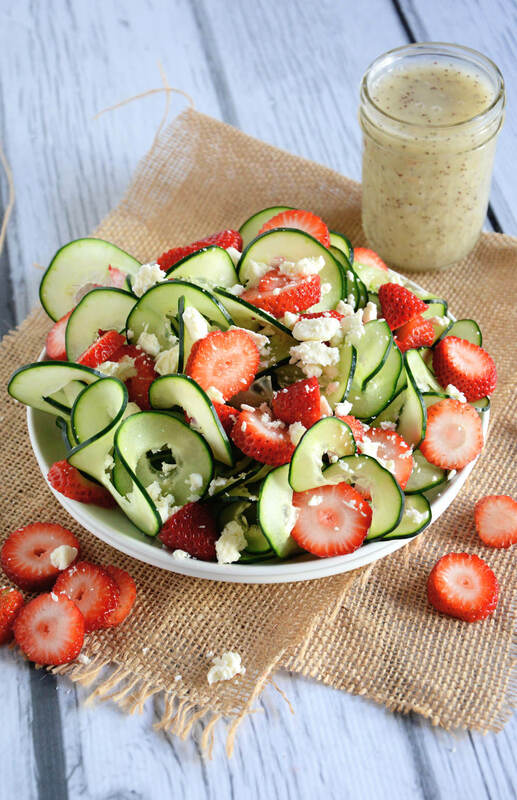 First up is a refreshing Cucumber and Strawberry Poppyseed Salad that will make a perfect lunch. This Watermelon and Cucumber Smoothie is the perfect light summer snack or breakfast on a hot day. This Tomato, Cucumber, and Avocado Salad is great dish to take along to summer BBQs and gatherings. Try making Cucumber Hummus as an easy and tasty summer appetizer. If you love pasta, these Cucumber Noodles with Garlic Shrimp will be the perfect healthy, summer dinner for you. Cucumber Vegetable Maki Rolls are a fun and refreshing meal for lunch or dinner. This week in comfort food, we wrapped up March with the ultimate in takeout, homemade and healthy pizza. First up was a Four-Cheese Pizza that is rich and yet, only 370 calories. Bacon, Tomato, and Arugula Pizza lets you indulge with everyone’s favorite meat and get your vegetables. Make these Individual White Chicken Pizzas, and freeze the rest for your next weekend craving. This Kale, Pepper, and Red Onions Pizza uses whole wheat pizza dough so it’s healthy from start to finish. Instead of having a salad on the side, pile the greens on top with this Prosciutto-Arugula Pizza. These Quick BBQ Chicken Pizzas use rotisserie chicken, so that this meal is easy anytime. Fresh Tomato-Feta Pizza is light, tasty, and has your favorite pizza toppings, like olives. We know that the final party of the year was coming up, so this week in food we gave you light party food recipes to get a jump start on your resolutions. First up was advice on how to build the perfect Cheese Platter. Try making this people-pleasing Caramelized Onion Spread for just 98 calories for your party. Watch this video for an impressive Smoked Salmon Bite appetizer tonight. Try this easy Pomegranate, Pear, and Goat Cheese Crostini as an appetizer or as a snack. Make these Pesto Stuffed Mushrooms for a fan favorite at just 48 calories. This Dark Chocolate and Cinnamon Fruit Dip seems decadent, but is actually made with Greek yogurt. Make these Spicy Shrimp Cakes with Corn and Avocado Salsa as an impressive appetizer or a light meal. This week in food, we gave you healthy Christmas treats and desserts to make for your holiday and office celebrations. First up was a quick 100-Calorie chocolate treat, Chocolate Peppermint Patties. A batch of these Chocolate-Almond Cheesecake Bars makes a great holiday gift. This Christmas Pudding with Brandy Sauce is a lightened version of the classic. Make these Maple Gingerbread Pots de Crème for a sophisticated take on holiday dessert. Make this homemade, moist and delicious Christmas Fruitcake for your celebrations. If you’re addicted to these Starbucks’ treats, these Skinny Cranberry Bliss Bars will be your new go-to. This Eggnog Cheese Pie with Bourbon Cream satisfies all of your holiday cravings at just 263 calories. This week on social media in food, we gave you some Cooking Light recipes to make use of all of those Thanksgiving leftovers. First up was Cranberry-Hoisin Turkey Buns, a tasty take on a Chinese sandwich. Try making these Spicy Turkey Soft Tacos with homemade mole sauce. Try using up your extra sides and turkey with Roasted Squash Soup with Turkey Croquettes. If you’re looking for something lighter for dinner tonight, try this Asian Turkey Salad with your leftovers. Make this Roast Turkey and Prosciutto Pizza with your leftovers instead of takeout tonight. Try these Jack Quesadillas with Cranberry Salsa for a spicy leftover meal or snack. Make this hearty Turkey Mushroom Bread Pudding to use up the last of your holiday meal. Save these healthy Thanksgiving tips and recipes we shared on social media this week, and always be prepared. You can also find healthy recipes year-round on our Pinterest! Cooking fires double on Thanksgiving Day! Make sure you have a smoke alarm in your home, and that it is tested regularly. Make sure you thaw your turkey safely, in the refrigerator, in cold water, or in a microwave oven, to keep it out of the temperature range where it grows bacteria! If you’re baking things ahead, or making the bird on the big day, make sure you check on the oven regularly and use timers. Don’t leave the kitchen unattended while your burners are going, and avoid loose sleeves while over the stove. After your guests leave tonight, make sure you check the house to ensure all candles or fires are out. Start packing up leftovers within 2 hours. Make sure you removed all the stuffing from the inside of your turkey, and store the two separately. Don’t leave leftovers in their serving dishes with plastic wrap or foil coverings, transfer them to smaller, airtight containers. Leftovers in your fridge are good for 3 to 4 days. If you have a lot, freezing leftovers is a great option, and they will keep for 3 to 4 months. First, we had a savory recipe for Maple-Cider Brined Turkey with Bourbon-Cider Gravy. And Ciabatta Stuffing with Chesnuts and Raisins to go inside. If you want something that will wow your guests, make this Truffled Pommes Anna instead of mashed potatoes. And try this light Green Bean Casserole with Madeira Mushrooms that is only 173 calories. Make these delicious Meringue and Streusel-Topped Sweet Potatoes this holiday and skip the marshmallows. And whip up this Cranberry Sauce with Apple Cider with ingredients you already have on hand. Got leftovers? You can make this Sweet Potato Buttered Rum Flan with your leftovers and things in your pantry. You can never have too many recipes for your leftover turkey. Try this Mexican Turkey Stew that won’t remind you of your holiday meal. This week in food, we gave you healthy Thanksgiving desserts, with plenty of pumpkin, that will be perfect after your big meal, or all holiday season long. And don’t forget to check our Pinterest for more desserts and Thanksgiving recipes. 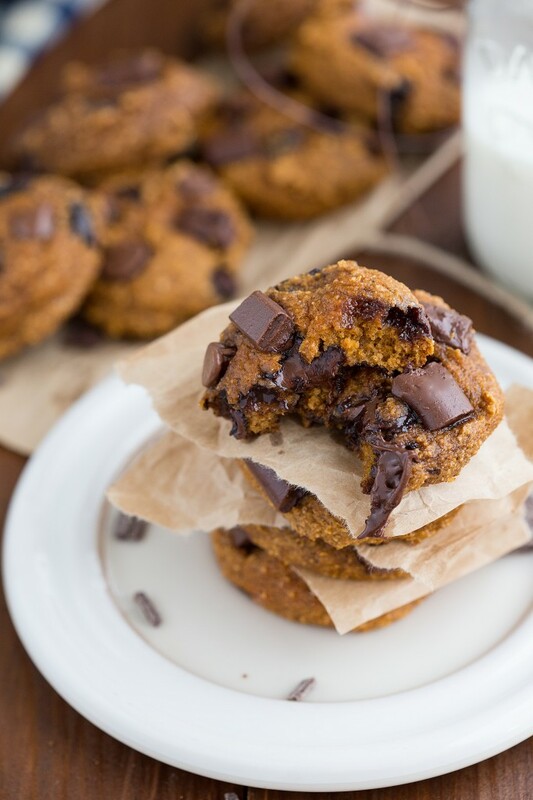 First up, is Flourless Pumpkin Chocolate Chip Cookies you can make ahead and keep on hand for the kids. Double-Cherry Upside-Down Cake is a delicious holiday twist on a classic. If pecan pie is your weakness, try this Bourbon-Pecan Tart with Chocolate Drizzle to end your meal. Try this Pumpkin Pound Cake with Buttermilk Glaze for a lighter pumpkin dessert fix than the traditional pie. If you prefer cheesecake to pie, try making this No-Bake Cheesecake with Pecan Caramel for your holiday dessert. Pumpkin pie is a Thanksgiving must. This year, try this lighter Vanilla-Bourbon Pumpkin Tart. If you’re feeling especially adventurous, try serving it with this healthier Coconut Whipped Cream. Make these decadent, individual Chocolate Chunk Bread Puddings this season.